At the ninth hole, you pick up your driver and smack the ball as hard as you can. Suddenly an ache develops in your back. Maybe it’s the center of your lower back, or is it somewhat shifted to the left? This has happened before. Ice packs, rest, and ibuprofen. It slowly goes away but you can’t golf for a few weeks. There goes that golf tournament. This is not just a golf injury, it can happen in any rotational sport. Tennis, lacrosse, hockey, etc. So what’s going on? How do we prevent this? Obviously, there are a lot of moving parts and many different injuries can occur. However, there is one particular injury that I find most common in my clinic. Sacroiliac dysfunction. Well, that is the source of pain and the symptom. The bigger problem and the true culprit: stiff lower back. First let’s understand the symptom producer, sacroiliac dysfunction (SI for short). Your hips are really three bones. They are: pelvis which is really two bones, and your sacrum. Your pelvis is heart shaped, and your sacrum is like a wedge driven down the center of the heart. The SI joint is the area where the sacrum and pelvis meet. The pelvis can rotate on the sacrum (well we think, this is a controversial topic). This area is imbedded with nerves and ligaments, and a rotation, (or if you prefer a torsional force) on this area can cause serious irritation. If it is bad enough, it can cause pain into your groin or down to the calf. It can cause the appearance of a leg length discrepancy because of the femur attachment to the pelvis. So, why does this happen? In a normal spine, there are certain movements that the vertebrae should be able to achieve. In sport, rotation is an important one. Each vertebra can only move so much before it ‘locks’ on the one below it like a cogwheel. When the lumbar spine has maximally rotated, then the next joint has to move. This is where the sacrum and pelvis come into play, and in a right handed golfer, the left pelvis tips back, or posteriorly. Keep in mind that the feet are fixed on the ground so there is only so much available real estate to create that swing. In a normal spine, there should be enough range of motion available between the lumbar spine and pelvis. If there is stiffness from the lumbar spine, the pelvis will be forced to tip back even further to get around the swing. Indeed, this is what I see. I frequently find a posteriorly rotated left pelvis on a right handed golfer. I also see a lot of Canadian golfers (who grow up playing hockey where being left handed is advantageous and therefore golf lefty) with a posteriorly rotated right pelvis. This pain is usually so specific that you can point to it. 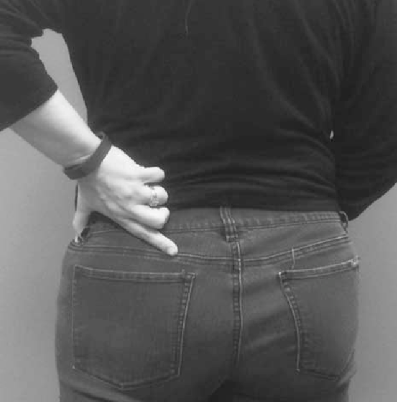 In fact, we have a test called the “Fortin finger test” which is a reliable predictor of SI pain. Patients will accurately point right to the pain. This may help. If it doesn’t, you need to see a physio to have it corrected properly. Now, onto the bigger problem: the stiff spine. There are several factors that can contribute to stiffness. There are leather-like capsules around the joints that connect one vertebrae to the next. They are prone to stiffening up like dried out leather. In addition, the spine does not have the same blood supply as a muscle. Blood is lubrication and nutrition. It needs movement to flush out the waste products that accrue and to allow for new fluids to enter the spine. This is why you fidget in a chair when sitting through a long class or meeting. This is also why your back may feel stiff in the morning. The good news is that both capsular stiffness and lack of hydration in the spine can be addressed easily. Rotation. Do this in the morning for a few minutes. Do it before sport. It induces rotation in the lumbar spine and preps your system for you golf swing, your forehand, or your slapshot. If you have available range of motion in your lumbar spine, you will not be adding additional torsion to your pelvis. 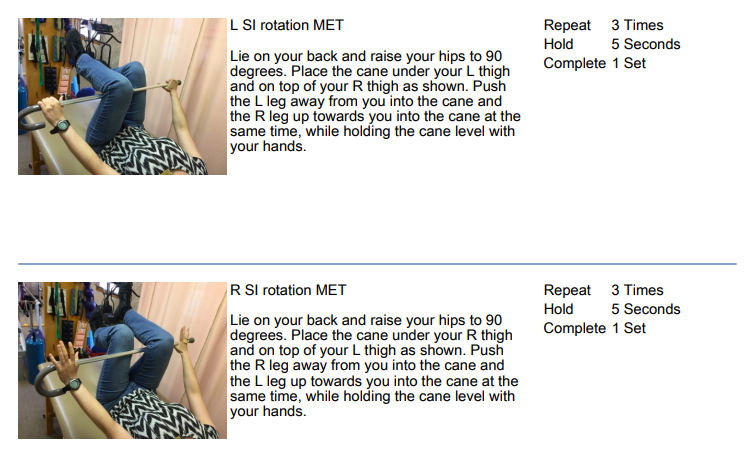 A stable and mobile spine will set you up for health throughout the rest of your joints. Keep it strong, and keep it moving.